A bad allergic reaction affects your child's whole body. Doctors call this an anaphylactic reaction. Your child's immune system may have reacted to food or medicine. Or maybe your child had an insect bite or sting. This kind of reaction can take place the first time your child comes into contact with a substance. Or it may take many times before a substance causes a problem. You need to get help for your child right away if his or her body reacts like this again. If your doctor has prescribed medicine, such as an antihistamine, give it to your child exactly as directed. 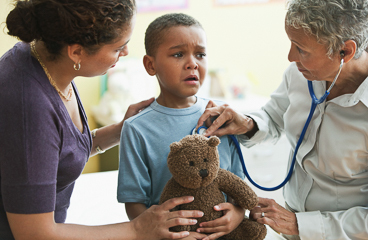 Call your doctor or nurse call line if you think your child is having a problem with his or her medicine. Learn all you can about your child's allergies. Your child may be able to avoid a bad response when you do or don't do certain things. For instance, you can check food or drug labels for contents that might cause problems. Your doctor may prescribe a shot of epinephrine for you and your child to carry in case your child has a severe reaction. Learn how to give your child the shot. Keep it with you at all times. Make sure it has not expired. If your child is old enough, teach him or her how to give the shot. Teach your family and friends about your child's allergies. Tell them what your child needs to avoid. Teach them what to do if your child has a reaction. Before you give your child any medicine, tell your doctor if your child has had a bad response to any medicines in the past. Enter W616 in the search box to learn more about "Anaphylactic Reaction in Children: Care Instructions".